Although I mostly do my workouts right as I wake up in the morning, I do designate some times when I workout later in the day. Usually, that includes zumba classes, boxing classes, or yoga. Sometimes I sprinkle in some other classes for variety. But yeah, most of the time I do my afternoon/evening workouts as fitness classes because that’s really the only time the good ones are offered (unfortunately). But for those times, I always wonder – how can I prep myself up beforehand? So I decided to do some research. 2 hours before cardiovascular training or strength training- eat a meal consiting of complex carbohydrates- e.g. fiber, whole wheat, vegatables and also include protein (nutrient balance is crucial) this increases glucose levels that can be used for our workout and essential for maximal strength- muscle endurance is more efficient when supplied with preworkout fuel. Don’t overeat before exercise as it can make you feel sluggish rather than energized. It can also lead to an upset stomach and cramping. Not eating before exercising can also have undesirable consequences. Low blood sugar levels can cause us to feel weak, faint or tired, and it may also affect our mental ability, reducing reaction times. If you’re having a small snack, depending on the content, eat around 1/2-1 hour before exercise. This snack should include fast-digesting (high glycemic index) carbohydrates and very little fat (which digests slowly), so that you digest the meal quickly and the fuel is available during your exercise session. Good ideas are: fruit, certain energy bars, pre-workout supplements, fruit smoothies, etc. Try not to go for any ingredients which digest slowly such as whole wheat or anything which contains a high fiber content. The snack should be easily and quickly digestable to give you the proper quick energy you need for the workout. Drink plenty of fluids during the day, as well as during and after exercise. Some sources recommend caffeine as well, however I avoid caffeine, therefore this tip will not work for me. 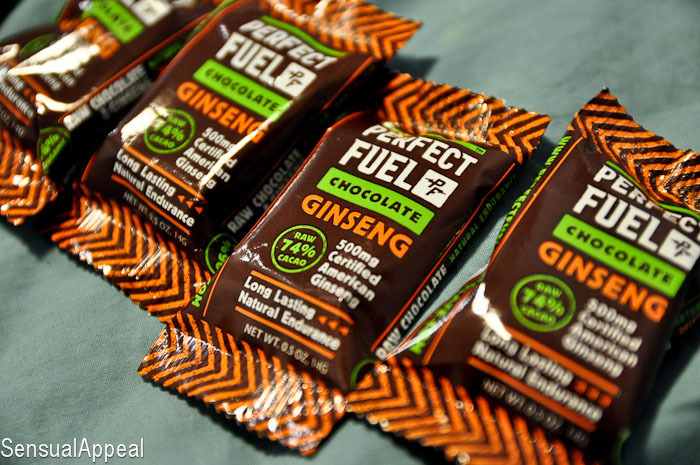 I recently received some Perfect Fuel chocolates with ginseng in the mail to try. Wow. I was very curious as to see how ginseng would taste with chocolate. I haven’t had the combo before and I was slightly skeptical but stayed optimistic. 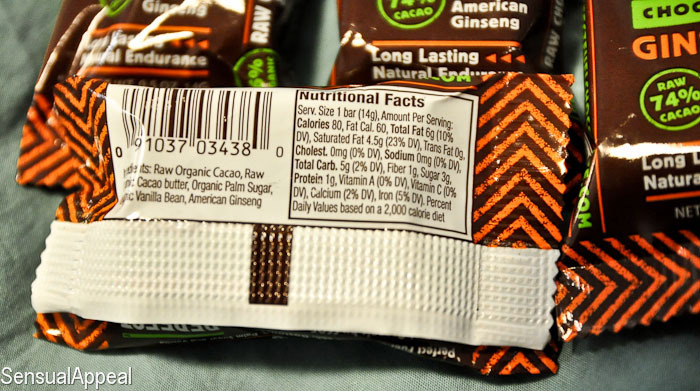 The nutritional facts are impressive with only 5 ingredients (raw and organic) which deliver 80 calories per chocolate. The size is pretty small but the chocolates have a very intense dark chocolate flavor with just the right amount of ginseng kick. It is more on the bitter side (only 3g of sugar) but it isn’t unpleasantly bitter – I personally like things not too sweet so this is nice. It’s so healthy and yet delicious and it’s STILL chocolate! The texture is hard but has a softer inside, however when you chew it, you feel a slight crunch to it. It’s really a very complex chocolate, while still being so simple. I am sold. The chocolates are created especially for healthy eaters with an active lifestyle. They are a nice pre-workout snack as they give you just the right amount of energy to push hard without any caffeine jitters. Um, thank god, because I can’t have caffeine (more on that another time). 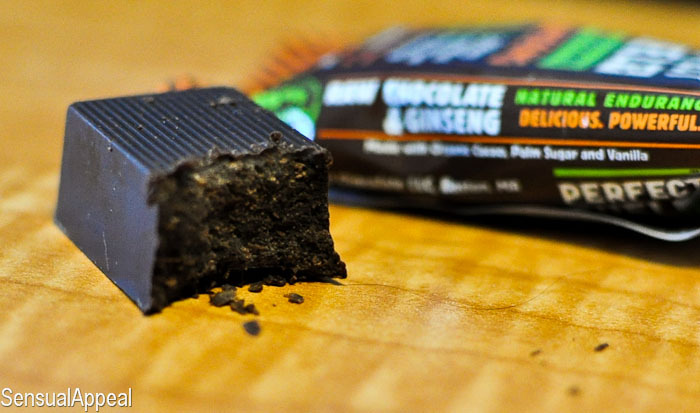 The chocolates contain 74% cacao and 500mg of ginseng in each serving. Check out the vast benefits of cacao and ginseng here. Do I recommend it? Absolutely. If you like very dark chocolates, you will love this one. And no, I’m not exaggerating. I’m pretty honest in my reviews (just look at my Energy Bar Wars post). Good pre-workout snack. I wouldn’t eat it as a dessert snack though as it wouldn’t satisfy my sweet tooth. But it’s not made to be a dessert snack so it’s all good. PS. I approached the company, not the other way round. Do you eat before a workout? If yes, what? What time of day you usually work out? This post is insanely helpful. Eating before workouts is something I really struggle with, as my schedule is so over-the-place that I rarely get the chance to work out at the same time every day. Usually I do plan when I will exercise that day, but sometimes it’s hit-and-miss. One thing I always get wrong, or forget to think of, is the food I just ate. This is brilliant. I am definitely going to be referring to this to see if I should be exercising after I eat – often if I’m out running I find myself feeling sluggish or full when I shouldn’t be. Thanks! You’re welcome 😛 Good luck tonight! Beat their asses! If I could, I would workout in the morning, too. Since I have to get up early for school it wouldnt work for me. 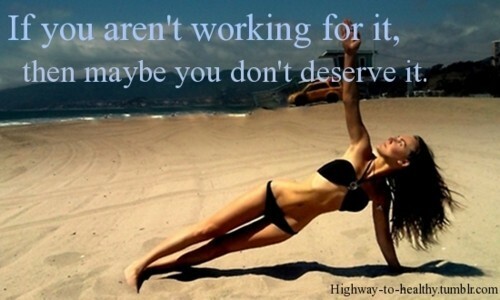 Thats why I workout in the afternoon.